DIAS digital pyrometers PYROSPOT are radiation thermometers for a non-contact measurement of temperature between -40°C and 3000°C. The infrared pyrometers for use in industrial environments are characterised by robust housings, excellent accuracy and high reliability. With an extensive range of accessories, these pyrometers can be fully customised to the individual application and integrated into system solutions. The digital ratio pyrometer models utilise a 2-colour system which has the advantage of measurement widely independent from the emissivity in range from 600°C to 3000°C. For configuration of the pyrometers and analysis of the measured data the PYROSOFT Spot Windows® software is available. TMS’s calibration laboratory can UKAS calibrate these infrared pyrometers between –30°C and 1500°C and we also offer calibration and servicing on site. Robust hand-held infrared pyrometers are also available, including ratio (two-colour) models, for temperatures between 250°C and 3000°C. See DIAS Pyrospot 80 Hand-held Precision Infrared Pyrometers. For industrial measurement of non-metal or coated metal, paper and packaging, building material, plastics and food. Cost efficient models for industrial measurement of surfaces like steel, ceramics, paper, food or glass. For industrial measurement of non-metal or coated metal, paper and packaging, building material, plastics and food. Small external head. 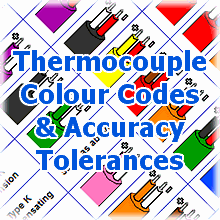 0/4 to 20mA or 0 to 5/10V or thermocouple (J or K) output. For industry and research. Steel and metal industries, kiln engineering, hardening, welding, brazing and ceramics industries. For industrial applications: steel and metal industries, kiln engineering, hardening, welding, brazing and ceramics industries. 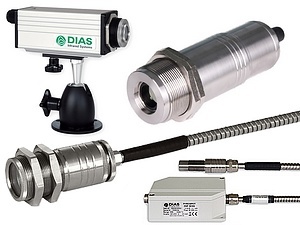 A range of accessories for DIAS pyrometers.